So it is. 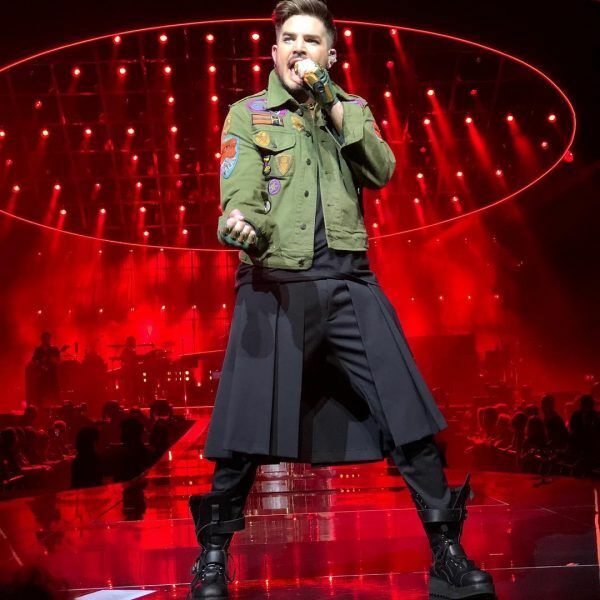 Since Mr Lambert was in Glasgow, you'd think he'd have worn the kilt without trews. Your liable to get "kilt" for that mistake round here! Here's Jack White of White Stripes fame. Who is Mr Lambert? never heard of him I am afraid. Tut tut, B&B, your ignorance of popular culture is positively encyclopedic. It's almost as bad as mine! Ah that explains it, I despise what passes for TV on a Saturday evening, this includes Britains got Pop Idol Dance Thing Talent show etc. i.e. the bloody karaoke shows which are often the fruit of Simon Cowells loins, 90% percent of which just disappear into obscurity. Nice to see someone survived that mill and found themselves a career. The fact that I moved somewhere with lousy radio reception and have been here since 1992 put an end to most of my plop music listenings. Oh and I am old as well! Big and Bashful wrote: The fact that I moved somewhere with lousy radio reception and have been here since 1992 put an end to most of my plop music listenings. The Internet is your answer here. Maybe this just trades one issue for another though (bandwidth / Internet access). We have friends who live just outside Callander and their Internet access is pretty poor. That said, you don't need much juice to listen to audio. I gave up on 'pop' music some years ago, though I still listen to 6Music. I use R4 for news, the occasional factual show plus the likes of ISIHAC, Just a Minute and the News Quiz. Now I live in the US I listen to NPR over the Internet and when I'm in public transport commute mode I've taken to listening to BBC podcasts - particularly Kermode and Mayo. For non US residents, if you have any interest in what is going on in the US I recommend you give NPR a try. I do use t'internet for podcasts, some from 6 music. Unfortunately the pc ethernet lead isn't long enough for use in the car, which is the only place I normally would have the radio on in. I love the Friday night comedy podcasts (The News Quiz and The Now show are firm favourites), I was also a fan of Simon Mayos confessions until the screwed the show up. One of these days when I have some spare cash I will replace the stereo in the car with a DAB set so I can get better reception than I can just now, when hiring cars I was surprised how good digital coverage has got, even on the Scottish Wet coast!. I will have a listen to those US stations you mentioned, always good to hear or see something new! That pic is slightly off. They all have quite an attitude in the facial expressions, except the woman back right, who just looks bored! And why is she wearing her winter coat? Good that JS is still wearing skirts, and with the facial fungus he's more clearly male than before. More than 480 public radio stations in the USA and a number of local radio stations in Canada broadcast BBC World Service programmes on terrestrial channels via FM, AM and increasingly on HD. These may be individual programmes as a supplement to their own schedules, or blocks of programming broadcast over several hours. Over 5.4 million weekly listeners tune into the BBC World Service programming in key US markets including Washington DC and New York. To find stations in your area along with their BBC broadcast times, visit our schedules page. Sirius and XM satellite radio networks offer digital radio services in Canada and the USA (except Alaska and Hawaii). XM radio carries the BBC World Service English mixed programme schedule 24 hours a day on channel 131 and Sirius radio carries a news-based schedule on channel 141. These are subscription services which require a special receiver. For information visit the XM Radio and Sirius Radio websites. Direct short-wave transmissions for North America have now ceased." Carl, you may find this article of interest. The UK nuclear sub fleet had instruction to open and act upon the prime minister's 'letter of last resort' if they couldn't pick up Radio 4's Today programme for 3 days running on the short wave radio. Not sure what their indicator that nuclear Armageddon had occurred would be if Today is no longer being broadcast on LW? FranTastic444 wrote: Carl, you may find this article of interest. Well, that was enough to make me head out to the garage where my short-wave receiver is (along with my automobile) and, sadly, the reception frquencies don't go down to 4.625MHz. Drat. In any event, for a good number of years, mainly in the 1980s and 1990s -- when I was naieve enough to think I coud do anything that made any sort of difference -- I used to listen to several "International" short-wave news broadcasts and used the age-old tactic of "Average them all out and the actual truth will be someplace in teh middle because everybody is either outright lying or slanting things". Aside from local propaganda news, I tended to use the BBC, Radio Berlin, Radio Moscow, the ABC (Australian Broadcasting Company), the CBC, and to round it out for grins, Radio Havana. I miss those days. The last time I fired the receiver up the airwaves on 5->15 MHz were a vast wasteland of preachers. (I have picked up "numbers stations" before, and also (long ago, and the statute of limitations has long since expired) managed to grab snipped from the Voice Of America (which was illegal for US citizens to intercept even if it was pretty much verbatim the sort of pablum spewed by the Boston Herald (a Murdoch publication) at the time). I caught some flak from my father on the matter, but when I posed the question to him, "Why are we transmitting the same propaganda to our sworn enemies as we're transmitting internally?" he shut up about the matter. The UK nuclear sub fleet had instruction to open and act upon the prime minister's 'letter of last resort' if they couldn't pick up Radio 4's Today programme for 3 days running on the short wave radio. Clearly the RN got word that the Beeb was going to stop transmitting. Otherwise it'd have been a mess. skirtyscot wrote: That pic is slightly off. They all have quite an attitude in the facial expressions, except the woman back right, who just looks bored! And why is she wearing her winter coat? He's not "man enough", then. It happens. The confident man is capable of almost anything that does not contravene physical laws, and tends to not take, "No" as an answer; the timid man is confined to walk in other's footsteps. Those who maintain that something is "impossible" should not interrupt those who are doing it.